Marco Rubio, Ted Cruz, Bernie Sanders Among Candidates Reacting To Violence At Donald Trump Rally : The Two-Way Two of the Republican candidates said Saturday they may no longer support Donald Trump should he become the nominee following the violent events at a Trump rally in Chicago on Friday night. 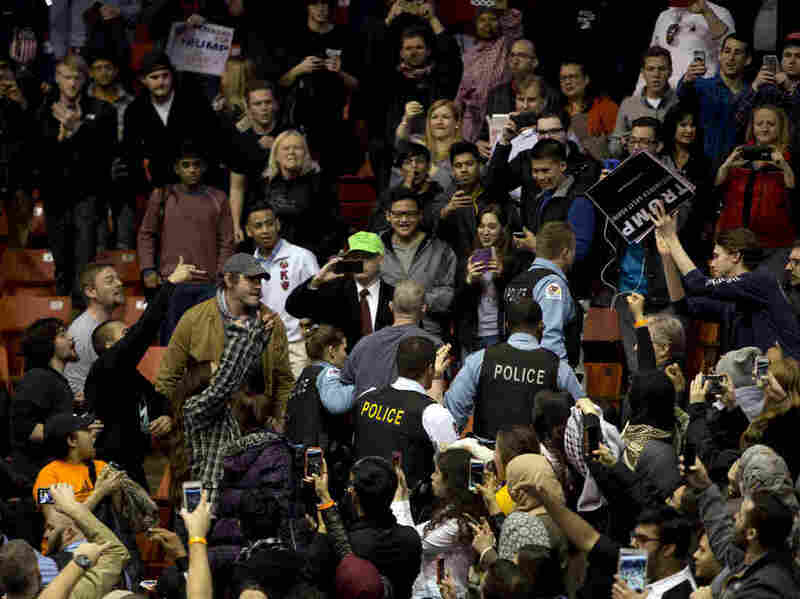 Anti-Donald Trump protesters confront his supporters during a Trump rally at the UIC Pavilion in Chicago on March 11, 2016. Five candidates for president weighed in on the violent clashes in Chicago at a planned Friday night rally for Republican frontrunner Donald Trump. The event was eventually canceled by the Trump campaign after protesters and attendees squared off on the campus of the University of Illinois-Chicago. Ohio Gov. John Kasich stated he may not support Trump should the businessman become the GOP nominee, according to The Associated Press. He said during a stop in Cincinnati that there's "no place for a national leader to prey on the fears of people." "America is better than this. We don't have to tear each other apart," Texas Sen. Ted Cruz said. "When you have a campaign that disrespects the voters, when you have a campaign that affirmatively encourages violence, when you have campaign that is facing allegations of physical violence against members of the press, you create an environment that only encourages this sort of nasty discourse." Florida Sen. Marco Rubio told reporters Saturday that he still intended to support the nominee, "but it's getting harder every day." On the Democratic side, Sen. Bernie Sanders' campaign stated on Twitter that they "will not allow the Donald Trumps of the world to divide us up," and posted a campaign ad about unifying the country. Meanwhile, Hillary Clinton released a statement Friday night calling for people to "address that anger together," and saying that "violence has no place in our politics." Five people were arrested Friday night, including a CBS News reporter who was charged with resisting arrest. CBS News said reporter Sopan Deb, who has been covering the Trump campaign since last summer, was thrown to the ground and handcuffed. The arrest was captured on video which, CBS News states, proves the reporter did not resist officers. Chicago police said two officers were injured on Friday night. They were taken to a hospital and released, according to The Associated Press. In his first public appearance since the events in Chicago, Trump spoke to a large crowd in Vandalia, Ohio. He blamed "professional protesters" and "thugs" for inciting the crowd. He also noted some of the protesters were supporters of Sen. Bernie Sanders, and he also blamed President Barack Obama for dividing the country. A group of U.S. Secret Service agents briefly formed a protective ring around Republican presidential candidate Donald Trump at his rally in Ohio, but then quickly left the stage and allowed him to continue his speech. It was not immediately clear why the agents rushed onto the stage Saturday morning to surround Trump, who appeared to jolt after hearing something in the audience standing behind his right shoulder. Four Secret Service agents then rushed onto the stage, as the audience chanted "Trump! Trump! Trump!" The agents quickly cleared. Trump did not explain what had happened, but said: "Thank you for the warning. I was ready for 'em, but it's much better if the cops do it, don't we agree?" A man attempting to rush the stage was charged with disorderly conduct and inducing panic, according to NBC News, citing local police. Trump continued the charged rhetoric, stating at one point that any protesters should be thrown "the hell out." He also cited the First Amendment, stating that he and his supporters have a right to say what they want and to be heard. Editor's Note: The following video contains graphic language. This video captures what's being described as an "attempted attack" on Donald Trump in Dayton, Ohio on Saturday.